I have quite a lot of projects on my hands right now, but I believe I'd be able to contribute with a short, Environmental-ish low-challenge area, if that's the type of level you're aiming for. Alternatively, I could take a stab at designing the gallery screens if you want me to. Whichever you'd prefer! I suspect you'd do a fantastic job handling the proposed gallery level hub, but just make what you'd prefer to make. I have no stylistic restrictions in mind, so environmental-ish is fine, and ludicrously difficult would be fine as well. Neat, I'll give the gallery hub a go first (should I blatantly disregard what you said about avoiding the x1000y1000 area, since this would probably be the starting section?). After that, if I see I'm on a roll, I'll try to start a small area too. Right now the only thing I'm actively working on is a small stupid joke level. I can probably throw together a challenge for this. I'm still not too happy with some elements (the picture frame and the column base), but it's starting to look more or less like an art gallery of sorts. Except for the lamp-thingy, which looks slightly demonic, but since this is supposed to be a cursed gallery, it might not be entirely out of place. I'm also planning to add stairs and a chandelier. Any criticism will be welcome. The idea is to build about 5-6 screens that have one or two large framed preview pictures of each area, plus a few nice-looking fillers. You might want to make a diagonal gradient for those slopes at the top part though. Agreed. In fact, I've already added those. They are a bit cumbersome to use, but they do make the ceiling shadows look much better. This is going better than I expected. I might be able to finish the hub area (with placeholder pictures) in a couple days. Are custom objects/tilesets allowed or can we only use what's given to us? Custom assets of all kinds are encouraged! Also, you probably won't be "given" anything and are free to start whenever you like. I uploaded the first version of the Gallery Hub. Hope you guys like it. It's currently 16 screens long (no duplicates), so we only have 284 more to go, which is a slightly less hopeless situation than before! I didn't include any music nor ambience. I think the silence fits the atmosphere here, but if you want to suggest anything, please feel free to do so (or just make any edits you want when compiling the area into the final level). I will open the editor up and see what happens. No promises. Looks good. Nice combination of tilesets there. The challenge in that screen seems a bit tricky, though, but maybe it's actually more doable than it looks at first sight (and the save point is very close). Can't wait to give it a try! 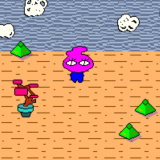 Hey, so since I'm kinda going for more of an exploratory vibe, is anyone interested in connecting their levels to mine? I'm going to have a few branching paths I'd like to be able to connect to _something_ and I don't know how I feel about just making them dead-ends. Connecting areas would be neat, but I think it'd be problematic for this kind of level, since each area will probably be designed around a different set of abilities, plus they're all already connected in a way (via the gallery hub). Still, maybe this could work as a secret/bonus, so the player can reach an isolated screen/sub-area that's not accessible via normal means in the area where it's located. I have a blocked path in my upcoming area that could be used for this purpose. Nice! You made pretty good use of those tilesets. I've seen way too many levels where that particular gradient ends up looking bad and/or really out of place, but in your case, it fits the scene perfectly. 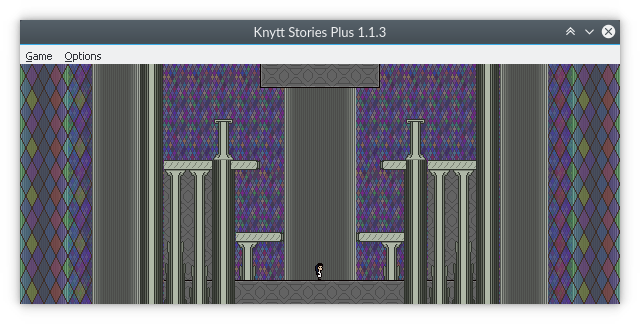 Level is ending up a bit larger than I had initially planned. Hope to get it done by some point tomorrow. Up to 45 screens so far. "Due to life being a thing, I'm just getting started on mine now. I have two ideas, so potentially two areas? We'll see!" everythingstaken and ihavefivehat are a maybe. Some people at the Nifflas Forums have also expressed interest in this, so maybe there'll be one or two more participants. Also, I might be able to contribute with an additional area besides the main hub (which is only 16 screens long). I thought of a theme for a new area that I haven't yet tried in any of my previous levels. This may or may not become a new area. I'm still experimenting with this new set and gradient. Looking excellent! Just so you're aware, it's pretty certain now that this level will be KS+, in case you want to use that for any features or visual embellishments. Good to know, I might take advantage of tints and attached overlays then. I love these features. Is there a general difficulty/theme to go for? I want to do an environmental section but I see a lot of challenge levels. Does it matter? If you want to do an environmental section, you should do an environmental section! Are Juni's abilities going to be reset upon completing an area and returning to the hub? I'm assuming that flags/keys or KS+ collectibles will be used to keep track of the player's progress, so each area can be freely designed around any set of abilities without us having to worry about the order they are played. So, since Fubaka pushed back the deadline to December, will this level's deadline be changed? Unless this level is pretty independent from the contest, I think entering this level with several months of possible dev-time would be a bit of a waste. Personally, I think it'd be interesting to try to meet the original deadline anyway just for the heck of it, although I agree that it doesn't make much sense to submit a level in a mad rush anymore. We could try and see how far we can go this week with the individual areas, then use the remaining months to finish whatever's still unfinished, assemble the complete level and polish it before entering it into the competition. This is my thinking as well. I'm challenging myself to get my portion done within the original timeframe. Since we're still not 100% on how we're getting everything integrated, we'll have a good chunk of time to decide on structure, connected areas, powerups, goals, etc. Before the extension, my big concern was doing all of that within the short time period. Now we don't have to worry about that, but of course we still need to make each portion of the level before we can put them together. Is there gonna be enough time to complete this level before the deadline? I mean I'd _love_ it if that was the case, but I'm not exactly sure if we've fulfilled the screen count yet. If not, then I'd LOVE to join in the small five-day period before the original deadline. EDIT: Just read the comments up above mine. I'll try to doodle a level with in the next few days or so. I haven't really finished a level at all, so this should be an interesting venture (if I can finish this one, at least). I didn't realize quite how little time I had for this! I'll just spend this full weekend on this and today. I didn't realize how much of a busy person I have become, but I do want to finish this. If you find you need more time, the deadline for the competition has been extended to December! We're just trying to see how much we can do by August 27th anyway. Dunno how to post images in my comment. I'm adapting the tileset I created for my previous level, DLFoTD, to make a proper environmental level/section. Starts with Run & Double Jump. Working hard to get it ready on the 27th! Also, quick question for anyone who can answer. How can I make this screen more interesting? My standard way of making cave interiors more interesting is glowing crystals. Those stray shadow tiles near the middle of the screen are pretty interesting though, what do they represent? The shadows in the middle of the screen are meant to be ledges- I had knytt standings on them in other screens! I've since removed them but I like both of yours and VG's suggestions so I'll definitely try to add them :) Unfortunately I am only 23/30 screens done... Progress is very fast! Detailing is NOT! Looking good! Besides what Sergio already suggested (Community Tileset #7 has a set of cave crystals, if you're interested), you could try making some holes in the background from where you can see another layer of darker walls or a hollow area. This adds a lot of depth to cave screens in my opinion. Also, I personally like adding small waterfalls coming out of the background walls in these cave areas, especially in screens that have bodies of water. Since everybody seems to be including at least two artifacts, I decided to go ahead and claim a second one. I'm adding a new secret room containing the 2nd blue artifact to my section. I'll upload the updated version later, hopefully in a few hours. 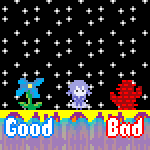 Fubaka has sent out the first round of feedback on this level, which reveals we have until the end of February to make any changes (that will be considered for the competition). Let's use that time to wrap this thing up! In particular, I'd love to get that final area included, along with an ending. Apparently any extra rooms we add will directly increase our score (maxing out at about 90 rooms) though I'm personally not fussed whether we strive towards that or not. Anyone who's interested in seeing the full feedback/scoring should send me a PM, as Fubaka's asked for scores to not be posted publicly. Great! Since I'm almost finished with my latest project, I should be able to help again with the last area and/or anything else this month.